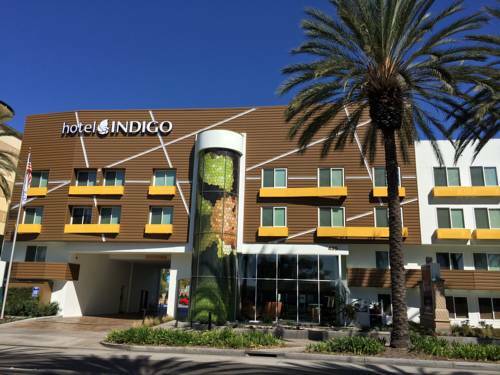 Even though our hotel lies in the heart of Anaheims modern leisure and business attractions, the Hotel Indigo Anaheim hotel reflects our areas history as a booming, blooming farming community. Look for agriculture-inspired murals in our rooms, a stunning garden with dancing, illuminated waters, and a cool California pool and cabana. Were also steps away from the main gate of the Disneyland Resort and walking distance from the Convention Center, and we offer a chance to enjoy locally inspired bites or specialty cocktails in our Chambers Bar & Bistro before you make your way out into our neighborhood. McCormick & Schmick's Grille: McCormick Schmick's Seafood Restaurant features 30 varieties of FRESH seafood on a daily changing menu. Recognized with Best Seafood Restaurant awards. CheeseCake Factory: The Cheesecake Factory is a more than just a specialty cheesecake store. It is a unique, upscale casual dining restaurant offering more than 200 menu selections including Appetizers, Pizza, Pasta, Seafood, Steaks, Salads, Sandwiches, and more. Katella Room: If you are planning on having a meeting in Anaheim, your event's facility must be well equipped. The Katella Room. 600 sq. ft. accommodates up to 25 attendees. The meeting room includes a projection screen and free high-speed, wireless Internet access.